LAKEWOOD, Colo. – When Oxi Fresh was founded in 2006, it started small with just one location, two products, and two phones. Now the carpet cleaning franchise is one of the fastest growing in the nation, with locations all across the United States and in Canada. This past year was extremely positive for the company. With new entrepreneurs joining their brand, the company opened 41 locations and ended the year with 370+ territories. This growth – along with various other positive factors – netted them a spot in the Franchise 500. 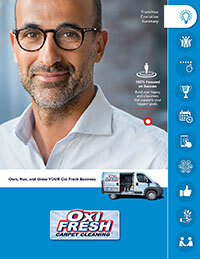 Oxi Fresh was also recognized by the Franchise Business Review for their high levels of franchisee satisfaction. And what 2019 holds is apparently more growth. Oxi Fresh expects to add 50 new carpet cleaning franchise territories across the nation. This will push them well over the 400 territory mark and bring them ever closer to the coveted 500 unit mark. “It’s hard to believe how far we’ve come,” said Mr. Barnett, commenting on the company’s continuous growth. When asked what has helped the brand grow so quickly, Mr. Barnett pointed to both their powerful cleaning system and their franchise support systems.